An app to clean the world's water? 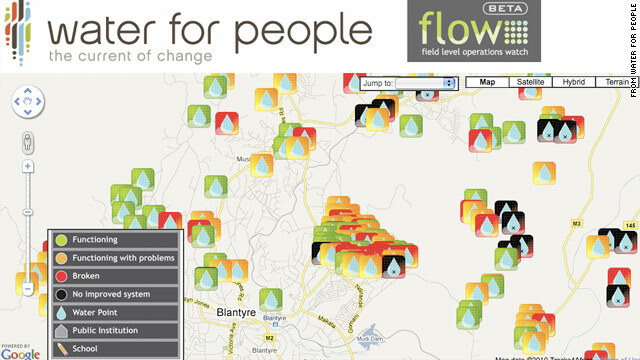 The Flow app for Android plots working and broken water pumps in the developing world. Camden, Maine (CNN) -- Water pumps can save lives -- but only if they work. That's the seemingly obvious idea behind a new smartphone app, called Flow, that lets people in the developing world snap pictures of water pumps that are broken. When you look at the details, it's not a given that these pumps will function. A substantial percentage -- perhaps 30 percent to 45 percent -- of water pumps installed by the United Nations, the U.S. Agency for International Development and various nonprofit development groups break within about a decade, according to Ned Breslin, CEO of the group Water for People, which launched the Android app in a presentation at the PopTech conference here in Maine. Often, the groups that have installed these pumps don't know they're broken, Breslin said. Or they turn a blind eye to the issue in favor of telling positive stories about how many pumps they've installed and how many people have access to clean water because of them. The consequences of this shortsightedness can be dire. Breslin told a story of a woman named Maria, a friend of his in Mozambique, whose 3-year-old son died after a water pump broke and he drank untreated water. Breslin recalled driving the boy's mother back to her house immediately after she found him dead. They passed by the broken pump on the drive, and she stared at it as if it were the devil -- a murderer who killed her child, he said. "We can no longer listen just to happy stories," he said. The smartphone app, which is designed on the Android platform, will help everyday people and field workers illuminate problems in installed water systems, he said. New financial schemes and perhaps technology should be able to help remote villages care for these foreign water treatment systems, he said, so that their aid isn't just temporary. The Flow app -- which is an acronym for "field level operations watch" -- is available from the group's website only, but it should be posted on Google's Android Market app store within a month, Breslin said. Flow is the digital version of an inspector's clipboard. People who come into contact with water pumps can snap pictures of them, complete questionnaires that are designed to show how well they are or are not working and log GPS coordinates. Other apps have aimed to accomplish similar things with geo-tagged data. SeeClickFix, for example, lets people report problems with city infrastructure, from potholes in the road to problems with subway cars. An app called Project Noah enables "citizen scientists" to snap pictures and log information about nature and wildlife, which professional scientists could use in research. The information from Flow is stored in a person's phone and then automatically uploaded the next time they come into contact with a high-speed mobile connection or Wi-Fi, Breslin said. People who only can send text messages can also send basic reports, he said, noting that smartphones are dropping in price in East Africa. Flow could be replicated by other nonprofits and for other purposes -- such as protecting the environment or mapping the effectiveness of health care, he said. All of the data is public and downloadable, he said, so universities could use the crowdsourced water pump data to do studies on the effectiveness of aide groups.